The Acadian Museum of Erath will induct Deno Joseph Boudreaux into the “Order of Living Legends” on Saturday, November 16th at 2 PM. He is better known as a television personality in Acadiana. His popular program the “Deno Boudreaux Show” airs on Acadiana Open Channel (AOC) and on PAX 22 in South Louisiana. The program airs in PAX 22 Saturday and Sunday mornings at 11 AM. The shows introduces and showcases various bands, especially those playing traditional “Cajun” music. Deno has received numerous awards from AOC for his efforts including the Viddy Award for Best Television Series. Boudreaux was born in Catahoula, St. Martin Parish, on February 11, 1934. His father was a share-crop sugar cane farmer and Deno worked there with his parents. He was brought up where only French was spoken in the household. As a child Deno had to quit school while in the 8th grade to help his parents on the farm. With his mother delivering twins and his older brothers in the service, Deno was required to quit school and help with the house-hold chores.
. 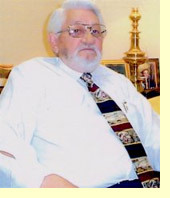 He worked for a time as an automobile salesman and then began selling insurance in 1960. He has been continuously employed in insurance sales since that time, joining Mutual of Omaha in 1971. He has received 22 separate awards for his distinguished service to the insurance industry. He is married, to the former Bertha Trahan and has five children. His hobbies are hunting, dancing and playing music. He served in the Louisiana Army National Guard, retiring after 30 years of service. His first musical effort was at 8 years of age, when he ordered a $1.50 harmonica from the Spiegel catalog. He learned to play “by ear”, and played for his own enjoyment and his parent’s entertainment. He never pursued music in a serious manner, and had put the harmonica aside for a few years. About seven years ago, he was invited to join some friends volunteering their musical talents to entertain at various nursing homes. They named the band “Les Amis” and Deno and his harmonica signed up. The band continues to entertain patients and residents in various nursing homes, rehabilitation hospitals and fundraisers in the Lafayette and Breaux Bridge area. Playing various gigs each week, they include numerous traditional Cajun songs in each performance. About four years ago, Deno purchased a French accordion, and taught himself to play that instrument, adding his talent to the band. In addition, Deno has expanded his harmonica abilities, presently carrying 22 different models with him to each performance. In addition to preserving our French musical heritage by its live performance, French is spoken between Deno and the nursing home residents and those who call into his live television show, requesting certain songs, or expressing their appreciation for his talents.